Supplement Group Yoga Classes or Practice Safely at Home: Some students prefer practicing yoga at home. Others love the energy and community of studio classes. You can have both! A 15 to 30-minute home practice significantly deepens the group class experience and helps you integrate the tools of yoga into daily life. A home practice consultation includes evaluation of your personal goals, consultation on how to integrate yoga into your busy schedule, and a written practice plan. Experienced yogis often have a workable plan in 2 sessions. Beginners generally benefit from a package of 4. Benefit from Personalized Coaching on Posture Form and Adaptation: Not even the best group-class yoga teacher can focus all of her attention on a single student. Private instruction is all about you! Your goals, your body, your alignment, the adaptations that would benefit your structure. Coaching sessions include feedback on how to properly perform yoga postures and adaptations for your individual body. Students who have attended coaching sessions report that even a single session helps them make huge strides in their yoga practice. Receive Yoga Instruction Catered to Specific Needs: Some students aren’t safe or comfortable in group classes. Tracy has worked with privately with students who needed help with stress management, sports training, managing menopausal symptoms, arthritis, infertility, cancer recovery, Cerebral Palsy, and Multiple Sclerosis, among other issues. Tracy also works with individuals with neck, back, and other acute and chronic physical injuries. Special needs instruction is most effective when done in a series of at least 4 sessions. Many students have a workable plan after 4 sessions. Others prefer to continue working one-on-one with Tracy indefinitely. Private yoga sessions can be held at Whole Life Yoga Studio in Greenwood, in your home, or at another mutually agreed-upon location. Travel charges apply for sessions more than 3 miles from Whole Life Yoga Studio. For more information or to schedule an appointment, e-mail Tracy@TracyWeber.net. Weekend and evening appointments are available. Daytime appointments are recommended when possible, however, as weekends and evenings fill quickly. Not in the area? Contact Tracy for information about phone or Skype sessions! Tracy Weber is a registered yoga teacher (E-RYT-500) through Yoga Alliance and a certified yoga therapist (C-IAYT) through the International Association of Yoga Therapists. She began teaching yoga in 2000 and has been a practicing yoga therapist for almost 15 years. Her primary teacher has been Gary Kraftsow, author of the books Yoga for Wellness and Yoga for Transformation. She has taken intensive workshops with other master teachers, including Margaret Pierce, TKV Desikachar, Jeanne Achterberg, and Joan Borysenko. Tracy holds a Bachelors of Science Degree in Chemical Engineering and a Master of Business Administration. She has a special interest in yoga practices for back pain, anxiety, depression, and building bone health. Tracy came to yoga to recover from a debilitating back injury, and she quickly fell in love with the physical, mental, and emotional benefits yoga provides. She founded Whole Life Yoga in 2000 and launched the first Whole Life Yoga Teacher Training in 2003. She has trained almost 300 yoga teachers in therapeutic yoga techniques since that time. Tracy teaches yoga using the Viniyoga methodology. The word "viniyoga" literally translated means "adaptation and proper application." Tracy believes yoga postures should be adapted for each individual practitioner. She infuses her sessions with caring, knowledge, and humor, and she uses yoga tools to help facilitate healing and growth in all areas of her students’ lives. 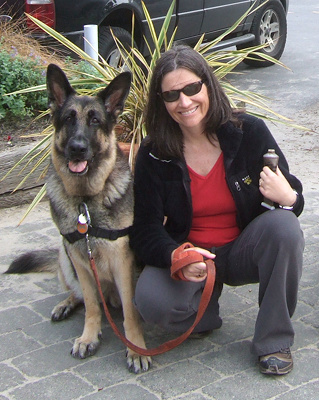 Tracy is also the author of the award-winning Downward Dog Mystery Series and an aspiring animal behaviorist. When she’s not teaching yoga, she’s usually at her keyboard writing or hanging out in nature with her German shepherd, Ana.